Well, I started this blog back at the beginning of January and then I kind of fell off the planet when it comes to updating. 🙂 However, I do have an excuse…. Back at the beginning of February I had surgery and while recovering I have been doing nothing but knit and crochet! How is that for an excuse! 😉 As soon as it is sunny I will take pictures of my projects and perhaps put a few new items up for sale in the shop. Speaking of the shop, K1 Sew Too is again open on Etsy so stop by for your Bearded Warmth pattern! My most current project is a felted drawstring bag which I am making for one of the nurses at Methodist. I had trouble breathing a couple of times while in the hospital and the last spell ended in a panic attack. Anyway, my nurse that day was named Michelle. She was great. It turned out I was getting enough oxygen (so said the little machine), but it just felt hard to breathe and the like… She got the right medicine, held my hand on one side and Aaron was on my other side. It was very comforting to have them there. I mean, I know it’s her job, but she was very patient and kind. She was funny, too. Aaron liked her as well. My other current project has a deadline of Monday! Yikes! Why a deadline you ask? 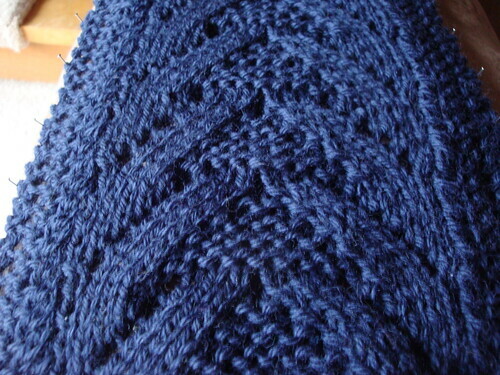 Well, there is a group on Ravelry.com where designers can have their patterns tested. This group has a set of rules for both the designer and the testers. The pattern I am testing is called Lady Sparrow Scarf and it is a great pattern. It is easy to memorize and the end result is great. I will post a link to her finished pattern once it is released. 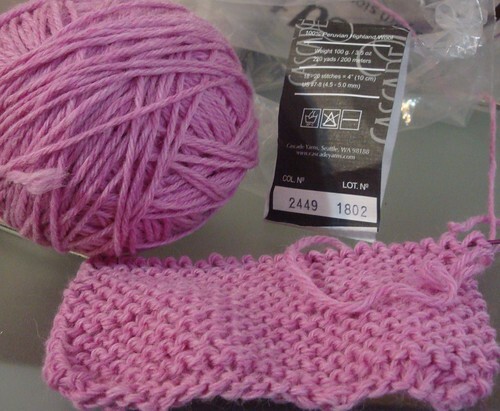 Below is my first half of the scarf and I plan to finish the rest right on time – Monday! Well, that’s about all I have for now. Do you have any gift projects or deadlines coming up?